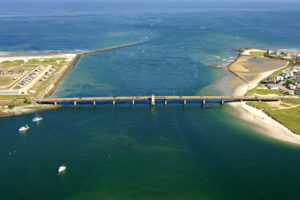 The state is getting closer to choosing how to replace the aging drawbridge that connects Hampton and Seabrook. Officials say the Hampton Harbor Bridge is one of only two bascule bridges left in the state. That’s a drawbridge that opens from the center to let boats pass. The bridge, built in 1949, carries up to 18,000 vehicles a day. The drawbridge opens around 800 times a year and has gotten stuck at least twice since 2017. Officials want to fix that, and make the bridge safer for pedestrians and cyclists. They’re reportedly leaning away from a replacement plan that could involve eminent domain of nearby homes. The likely alternative could require more environmental permits. Officials are discussing the plan further with residents this week and hope to have a final proposal out this spring. Construction would start in 2023.